A bunker spill has been reported after Tunisian Ro-Ro ship Ulysses crashed into Cyprus-flagged containership CLS Virginia on Sunday morning, October 7, while the boxship was anchored about 28 kilometres north-west of Cape Corsica. Fortunately, there have been no injuries to the crew members of either vessel. Initial assessment indicates that CLS Virginia sustained significant damage to its starboard side from the impact. 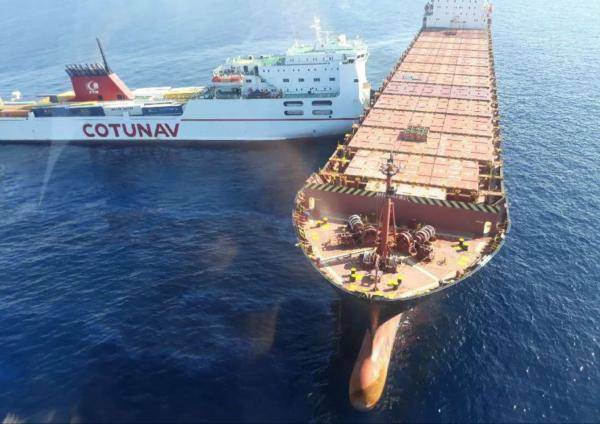 Namely, the ship’s hull has been ruptured resulting in a hole of several meters, according to a statement from the Maritime Prefecture of the Channel and the Mediterranean. The ship’s fuel tanks have been breached by the impact, causing a fuel spill. The French maritime authorities said that an oil strip of around 4 kilometres in length and a few hundred meters in width has been detected. The strip is floating in the direction of the Corsica’s coast. On the other hand, the operator of the ferry, Tunisian CTN, informed that Ulyssis was in a good condition. The company added it was closely monitoring the situation and damage assessment, and that it would resort to legal action to secure the ship and the transported cargo. Several ships have been dispatched to the scene to contain the pollution. Assistance has also been offered by Italy as part of the Ramogepol accord between France, Italy and Monaco to act jointly in cases of maritime pollution. A plan is yet to be confirmed on the separation of the two ships and further action. An investigation into the cause of the incident is underway.